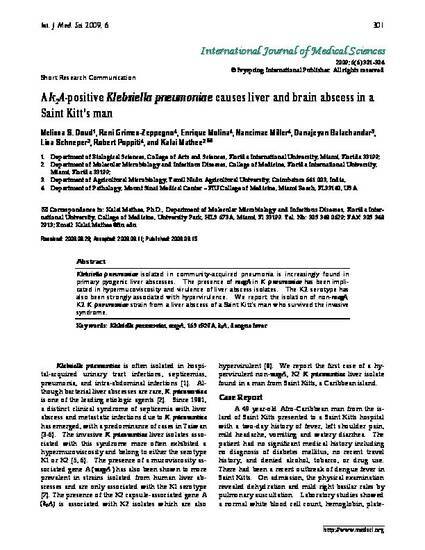 Klebsiella pneumoniae isolated in community-acquired pneumonia is increasingly found in primary pyogenic liver abscesses. The presence of magA in K. pneumoniae has been implicated in hypermucoviscosity and virulence of liver abscess isolates. The K2 serotype has also been strongly associated with hypervirulence. We report the isolation of non-magA, K2 K. pneumoniae strain from a liver abscess of a Saint Kitt’s man who survived the invasive syndrome.